Disconnect all ULINKpro adapters from the PC and from your target system. USB cables longer than 2m(6.0 ft). USB connections via docking stations or port extenders. A battery-powered notebook PC. Connect your AC power adapter to the notebook PC. Exchange the USB cable with another one to ensure that the cable is not defective. Try to connect ULINKpro to a different PC where MDK-ARM is installed. In case the LEDs still do not work properly, your ULINKpro is broken. If you have another ULINKpro, you can confirm the defect by comparing the behavior. Please proceed to Exchange Procedure and report code UPH1. Ensure that Keil ULINKpro is listed in the Windows Device Manager under Universal Serial Bus Controller. If the driver is not listed, then install the driver as described in Installing Drivers. If the installation fails, then contact the Keil Technical Support and report code UPH2. 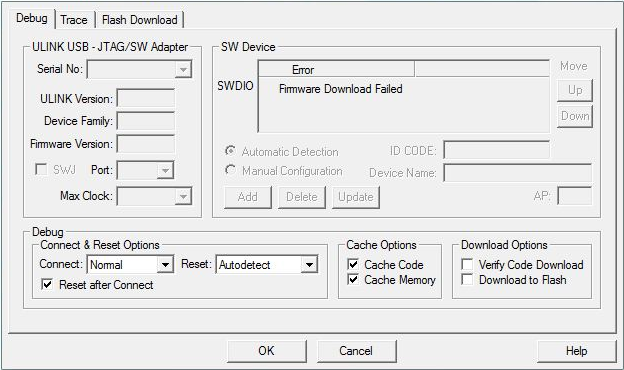 Is the error message Firmware Download Failed shown in the SW (or JTAG) Device box? If true, then proceed to Exchange Procedure and report code UPH3. Is the error message USB Communication Failure shown in the SW (or JTAG) Device box? If true, then proceed to Exchange Procedure and report code UPH4.